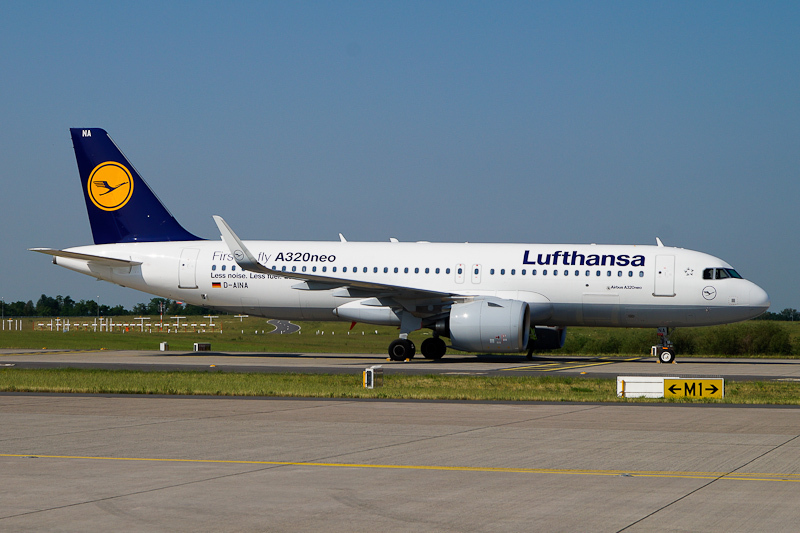 Lufthansa is the launch customer of the new generation Airbus A320 neo airliners. The Lufthansa Group ordered a total of 116 neo-type aircraft, 45 of them the larger A321neo version. The new aircraft are intended for Lufthansa and Swiss. The Airbus A320neo is 15 percent more fuel efficient than today's comparable models; the 85 decibel maximum noise-level contour of a starting A320neo is around 50 per cent lower than that of the older A320 models. In Lufthansa'Airbus A320neo can accomodate 180 passengers. On 1 December 2015, regsitration D-AINA was reserved for Airbus A320-271n(WL) c/n 6801, and on 11 December 2015, the Airbus A320-271n(WL) flew first with Airbus test-registration D-AXAQ. On 20 January 2016, the Airbus A320-271n(WL) was handed over to Lufthansa as the first Airbus A320neo worldwide. On 21 January, the Airbus A320-271n(WL) was registered D-AINA and on 22 January, the D-AINA was ferried from Finkenwerder to Frankfurt and its first commercial flight followed on 24 January. The airliner features special markings: "First to fly A320neo" "Less noise. Less Fuel. Less CO2." On 4 June 2016, Airbus A320-271n(WL) D-AINA was seen during the ILA Berlin Air Show 2016 at Berlin-Brandenburg / Willy Brandt International Airport.